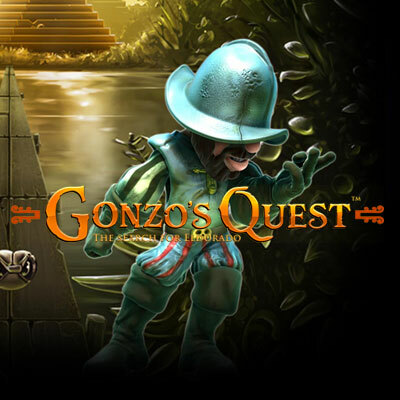 Get on a voyage with Gonzo's and satiate his quest for the ancient treasure! Gonzo, a Spanish explorer sets out on a quest for Gold in this thrilling slot game by NetEnt that is packed with exciting features and is a 5 reels, 3 rows slot game that comes with fixed 20 paylines. Gonzo's Quest not just has a unique theme but also varied interesting features that include Avalanche Reels, Free Falls as well as everyone's favourite multipliers but doesn't include any reel spins. Set in the mythical lost city of gold, Eldorado, Gonzo's Quest however takes inspiration from a real life Spanish conquistador for its main character Gonzo. This slot game was launched in the year 2011 and has ever since become a cult favourite. A lot of casinos provide free spins no deposit bonus to bask on the popularity of this slot game. Read our review below to unveil other interesting features of this slot game. If you like the sound of it till now, why not try the demo free play mode here before you go all out and stake your real money. What are the Rules of Gonzo's Quest Slot Game? The game features 20 fixed bet lines, and 1 to 5 bet levels that support different coin values. When you select the 'Max Bet' feature, the game plays at the highest bet level on the predetermined coin value. With the 'Autoplay' option, the game plays continuously for the pre-selected number of rounds. All the winning combinations and payouts are in accordance to the paytable. Bet line wins pay from the leftmost reel to the rightmost reel where only the highest win per bet line is paid. To calculate your win in coins, it is equal to the value as given in the paytable multiplied by the active bet level. If there are any active multipliers, the amount would be multiplied by applicable multipliers. To calculate your win in currency, multiple the win in coins with the applicable coin value. In case of simultaneous or concurrent wins occurring on different bet lines, the wins will be added to display the total winning value. Wins in the base game pay only on the fixed pay lines. The only exception is wins occurring via free fall symbols. When 'Playing for Fun', game history will not be available. Upon reaching the maximum multiplier, all wins are paid multiplied by the maximum multiplier until no new wins are triggered. When no new wins are triggered, the multiplier will change back to the initial multiplier. In the midst of densely vegetated jungles is the land of gold – Eldorado which Gonzo is certain to discover. This video slot with crisp 3D graphics and great sound effects is nothing short of amazing. The soundtrack of stones crashing against each other is intermittently interrupted by the normal winning sounds caused by the free falling symbols. The game begins with an introduction scene which distinguishes this slot game from many others where a video featuring the main character Gonzo jumps off the ship to go on an adventure of his own to find gold. The reels of this slot are set against a wall of stones with carvings and Gonzo standing on the left side of the reels watching them spin. This not only adds some quirk but also elements of fun, time and again. Whereas on the right side of the screen is a waterfall with water pouring out of a stone carving. Outlining the reels are numbered paylines so that it becomes easier for a player to figure out the wins in accordance to the betlines. Overall, the Gonzo's Quest slot game looks great in each and every aspect. How can I Play Gonzo's Quest slot game? Spanner Icon – Clicking on the spanner icon will let you access the game settings under which you have an option to turn on or off a few functions like the introductory movie and the 'spacebar to spin' feature. It also allows you to view your game history. Game history is unavailable to view in the play for fun mode. Autoplay / Auto – Under the advanced Auto play options, you have a choice to set when you wish to stop the Autoplay settings with the following options : on any win, increase or decrease in cash, when free falls is won, etc. If you wish to go back to the default autoplay settings, simply click on reset. Sound Button – The slider under this option allows you to adjust the game sounds. You also have an option to mute the sounds all together by clicking on the sound button. Help (?) - This option available on the game panel takes you to the game rules when clicked. Spin Button – Clicking on the spin button enables the reels to spin at the predetermined bet level. You can also use the spacebar to start spinning the reels alternatively. Green (i) icon – Upon clicking this option, the paytable appears. Left / Right Golden Arrows – These appear when you click on the (i) icon in the game panel. The left and right arrows help you to move through the pay tables, whereas the middle button enables you to return to the game. Bet Button – The bet button determines your bet amount per spin. You can adjust the bet by clicking +/- options available under the Level Tab. There are a total of 5 levels that take the bet amount from 20 to a maximum of 100. Coin Value – This online slot offers coin values that range from .01, .02, .05, .10, .20 and .50 for the players. Take your pick and set out on a quest with Gonzo. Standard Reel Symbols – The standard reel symbols are represented using square stones inscribed with seven different things namely 4 face masks, snake, bird and a dragon like looking animal. The symbols with grey background and blue face makes for the highest paying symbol. The pastel coloured symbols marked by the colours green, golden and purple form the medium paying category of symbols. Whereas the low paying symbols are symbolized by red and blue colour. Wild Symbol – The wild symbol is denoted by a gray coloured inscribed stone with an encircled golden question mark atop it. The wild symbol substitutes all other symbols including the free fall symbol. The wild symbol only appears on reels 2, 3 and 4. Scatter Symbol / Free Fall Symbols – The typical scatter symbols under this slot game are called Free Fall symbols and if you are lucky to land three on any payline, you shall receive 10 Free Falls. These symbols must appear together in a sequence to trigger the free falls. This feature has been explained in detail later. A minimum of 3 free fall symbols are required to activate the free fall bonus feature that awards 10 free falls (free spins). These symbols only ever appear on the reels numbered 1, 2 and 3. Hence, This feature is similar to a free spins round since players can get 10 free spins on the slot machine along with a multiplier that ranges between 3x to 15x majorly depending on the number of Avalanches coming in on the reels. The free fall symbols must land on the reels in succession starting from the left most reel and going to the right. This bonus round is played at the bet level that triggered this bonus. Any winnings under this round are clubbed with other winnings from the round that activated this feature. Gonzo's Quest introduced the unique and now famous Avalanche feature where the reels instead of spinning fall from above to replace the old symbols. Under this the blocks explode and new symbols from above fall to substitute the vanished or disappearing symbols. This feature manifolds your chances to win when new symbols cascade from above. The Avalanche feature continues until there are no more consecutive wins. With each consecutive win, you get a chance to multiply your winnings starting from 1x and going up till 5x in the base game. Whereas when the Free Falls bonus round is activated, the multiplier can go up as high as 15x. When the multiplier reaches the maximum level, all wins are paid at the maximum multiplier level for successive wins until there are no further wins. Gonzo's Quest Slot is powered by the pioneering software provider NetEnt and is also the flagship slot that introduced the Avalanche feature to the world of online slot games. This slot game is testimony to why all the offerings by this leading software developer are enjoyed and revered by new and professional players alike. Netent is the provider of top rated casino games and renders above the class gaming solutions to ensure that its games run seamlessly on all compatible devices and gadgets. A name synonymous with innovative products and games, NetEnt has ratified the claim with Gonzo's Quest wherein it offers incredible games one after the other. Providing the right doze of adventure and thrill to the players, Gonzo's Quest has been around for a long time now but continues to hold its appeal. With plenty of chances to win a life changing jackpot prize, the Gonzo's Quest slot by NetEnt is a must try offering for players looking for thrill and entertainment galore. Regardless of the bet levels, the players are in for mighty theoretical returns of 96%. With a high variance, Gonzo's Quest slot employs HTML 5 technology which ensures that the slot runs with out any glitches on all the compatible and optimized devices . So, give this 3D video slot a shot and try your luck to hit big wins! Please enter your review for the Gonzo's Quest Slot.